Edmonton police may still have a chance to get a new helicopter after city council voted Thursday to keep the request on the budget books. The helicopter appeared to be headed for the chopping block after Coun. Ben Henderson raised a motion to remove the $6.2-million request from the city's 2019-22 capital budget. "Do we need two of the new helicopters in the air?" Henderson asked fellow council members. "Given how tight things are, I think we can slow this process down a little bit." 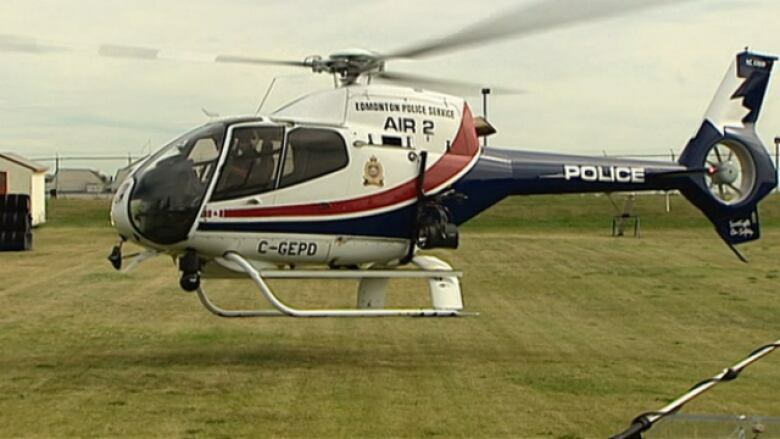 The Edmonton Police Service unveiled its new $5.9-million, state-of-the-art Air 1 helicopter in February. The Airbus H-125 model is considered one of the best helicopters in service, police said at the time. On Thursday, Coun. Sarah Hamilton suggested the new chopper could be financed through debt — money the city would borrow and the police would pay back. "It puts the onus back on EPS to make the case for the $6-million helicopter." Council voted against Henderson's motion and agreed to Hamilton's, which included having EPS come up with a business plan. "Then they can also decide, is this the best way to spend that money?" Hamilton said. "Could we lease a helicopter, could we buy one second-hand, could we share one? So there are a lot of options here and it keeps the helicopter request alive." Police told council during their budget request that the service's older chopper, Air 2, must be retired by 2021. The model has been discontinued and it's difficult to get parts, police said. EPS was asking the city for $6 million to buy another Air 1, which can fly for three and a half hours at a time. Several councillors recalled police requesting money for a new helicopter four years ago. At the time, Andrew Knack voted no. He said he has changed his mind since going on a ride-along and seeing the value of that type of policing. "I guess that's how they get you," Knack said. "When you get to go up in the helicopter, you get to see it yourself." Helicopters are often used to chase suspects during high-speed pursuits on foot or in vehicles, for large-scale disturbances, and during missing persons cases, police said. Police are expected to report back to council in spring 2019 with a business case for a new Air 1.